Most of the small business owners I meet with are aware of the importance of showing up in Google search results, and many use popular Google products like Gmail and Docs. Some of them have even been venturing into the world of Google Plus, creating business pages on the new social platform to promote their products and services. But even my savviest clients often overlook the free tools that Google provides that can help them improve their websites to better promote their companies: Google Analytics and Google Webmaster Tools. The set-up and configuration of these tools may be a bit more than the typical business owner can deal with themselves, but it’s very easy and your webmaster (or whoever designed your website) should be able to help. Once installed, they can both provide a wealth of information about activity on your site. 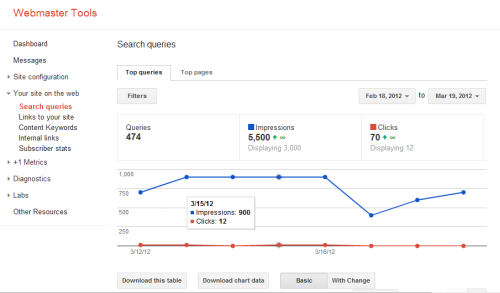 Webmaster Tools has a section titled “Your site on the web.” There you can see which and how many search queries returned results with your company’s site listed among them (impressions), and which and how many queries actually brought visitors to your site (clicks). This is tremendously useful in determining which keywords are most effective at driving traffic to your site. The “Content Keywords” feature will show you where these keywords show up within your site, which can help you better optimize individual pages for specific search phrases. Google Analytics provides you more data than you can possibly use, but there are basics that everyone wants to know: how many unique visits, where is the traffic coming from (search vs. referring sites), which pages get the most traffic, etc. Google Analytics allows you to customize a “Dashboard” where you can see only the information that is relevant to you and your business. I normally set my customers up with a Dashboard that shows them Visits/Visitors, Top Content, Landing Pages, Traffic Sources and Pages per Visit/Avg. Time on Site. This gives them a sense of what people are looking at and where they are coming from. Pages per Visit and Avg Time on Site are indicators of how engaging your content is — the better the content, the longer visitors will linger. 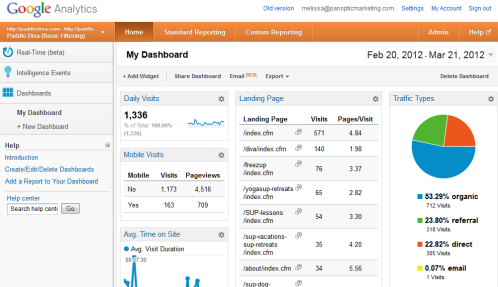 You can also see how visitors navigate through your site by expanding the Content reports. For customers undertaking link-building SEO activities, the Referring Sites report can also be added to the dashboard so they can monitor which sites are sending traffic their way. Truly, there is nothing you won’t be able to find within the reports — you just have to know what you’re looking for! Previous: Facebook Timeline: Is Your Page Ready for the Change? Next: Get More Bang From Your Blog: Optimize Posts!